At Shade Pro we only use only the highest quality materials. All our new sails come with a 10 year Guarantee! The shade sail technology has advanced greatly in the last 10 years. New shade sails manufactured by Shade Pro are at the cutting edge and of these improvements. We only us the highest quality cloth, long life stitching, additional webbing for the corners and our wire system works! Your shade sail may be able to be repaired instead of replacing. We can advise which is the better option. Sail cloth will usually last a long time. The stitching generally fails first. Because the incorrect stitching has been used in the manufacturing process. At Shade Pro we can re stitch your sail with long life stitching to make it look new again, reducing the costs of a replacement sail. Cleaning and re tensioning your shade sails will extend the life of your shade sails. Are you sails looking dirty and tired and lose? If your shade sail is a light colour, chances are the sails are collecting dust and grime the can be seen creating a not so appealing look. Removing, pressure cleaning and re installing will give your sails the look when they were new. We can remove your shade sails while you're waiting for your insurance company approval. At Shade Pro we know how to construct a quote for insurance companies. The wording is very important to ensure you are covered by insurance. When extreme weather has occurred and your sails are damaged. We can remove your sails while you’re waiting for approval and replace once approved. We work with you and keep you updated every step of the way. Quality workmanship, we only use the highest quality materials. We are professionals and have been in business for over 20 years. Our designs not only create shade but also street appeal. Call us today to chat to a professional about creating shade a solution for your home. 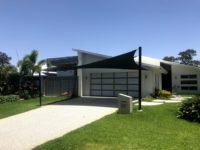 If you are looking for the best shade sails Gold Coast has to offer then we have the products you need. Shade Pro QLD is the leading provider of shade sail products and services in Queensland, offering high quality shade sail repairs and installations for both home owners and commercial clients. With over 20 years worth of experience, and services designed to help our local community, we are confident in our ability to provide you with shade sails that match your budget and household needs. Our products were constructed with high quality workmanship, and they offer protection against the heat and direct sunlight of Australian weather. We are also a leading specialist in design and customer satisfaction, which means that we are constantly updating our products and expertise, so as to better serve the needs of our clients. So if you are looking for a new set of shade sails then here’s what we can offer you. Purposes and Benefits Shade sails are not only useful for protecting yourself from heat and direct sunlight, they can also be used to provide other benefits. For example, their soft fabrics allow soft, cooling breezes and light to pass through during calm days. They can also be used as aesthetic decorations for relatively empty parts of your home. If you own a business establishment, a few shade sails can make your exterior area look more interesting Furthermore, shade sails may also be used to protect various items all over your property, including your car, your boat caravan, certain parts of your deck and even your pool. 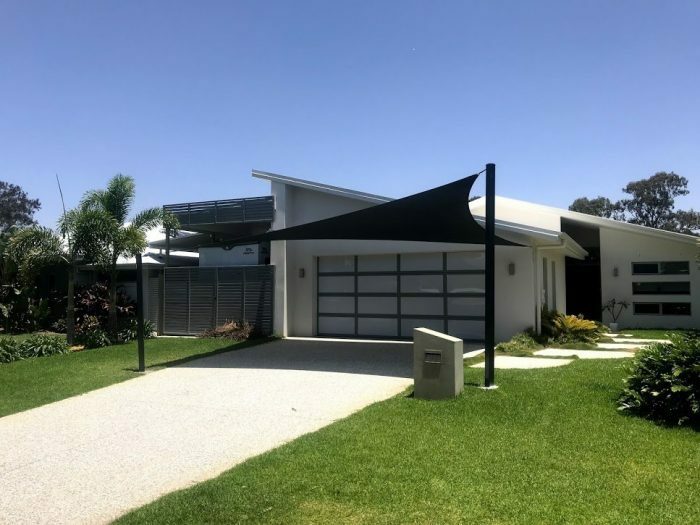 Certain shade sails may even be customised with strong stitched seams and stainless steel eyelets to make them more durable and easy to install, especially in less accessible areas of your property. .
We are also experts at making street appeal by adding heights to the sail installation, which can help boost the aesthetics of the rest of your property. In fact, Shade Pro QLD has set up shade sails for restaurants, cafes, outdoor food stalls and many more. Some of our shades were used to shade entrances, while others were used to shade tables and chairs. A few were installed for purely aesthetic purposes. So if you would like a few shade sails of your own, give us a call and we will provide you the services you need. Our waterproof shade sails can withstand moisture, rain and low temperatures. Their surfaces bear enough water tension to prevent water/moisture build up, and we install them in such a way as to allow rain water to safely fall to the ground. Our shade sails are not only useful for blocking out heat and direct sunlight, they also offer 90% protection from harmful UV rays. The fact that they are affordable and easy to install also means that you can protect several parts of your home from UV rays with little to no trouble. 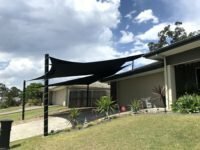 Quality Workmanship Shade Pro QLD offers the best shade sails in Queensland, including cross over shade sails. Our products are made from Z16 Shade Cloth, which offers optimal heat and glare reduction as well as more comfort and protection compared to other shade sail cloths. Our items are also durable, and can last for up to 10 to 15 years on average. Not only can they withstand heat, wind and rain, they also don’t accumulate water during rainstorms, thanks to the way we install them. If you’re worried about cleaning and maintenance, don’t be. Our shade sails are also easy to clean. You won’t need to buy any special cleaning agents, nor will you need to spend hours washing the dirt off their surfaces. Just follow the cleaning instructions that we give you, and you will be able to keep your shade sails clean and beautiful. Finally, we also would like to add that Shade Pro QLD offers the best shade sail Gold Coast prices in our community. 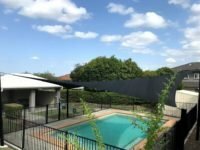 We offer some of the most affordable installation and repair services in Queensland, while our products’ prices are based on the latest industry standards. So if you need affordable shade sails then we have the solutions you need. If you think your old shade sails are worn out and in need of replacement then our replacement services will give you the solutions you need. Our team will replace your older shades with top quality Z16 shade cloths. We will also install your new shades in areas where they can offer the best protection from the sun and the wind. So if you need to replace your older shade sails then give us a call. We will provide you the services you need. Our commercial installation services were designed specifically for business establishments. Whether you’re a cafe owner who wants to give his or her visitors more shade, or a store owner who wants to make their shop more attractive to people, we have the right products for you. Not only can we install large quantities of high quality shade sails on your property, we can also give you a great wholesale price for our products and services. Give us a call if you would like to learn more. Aside from installing sail shades on our clients’ properties, we also offer repair and maintenance services. If your shade sails get dirty, or they get damaged by wind and rain then our team will come over to repair them. We will also replace damaged eyelets, repair torn seams and patch up any part of your shade sails that require our attention. Please contact us if you require additional information about our repair and maintenance services. We will respond as soon as possible. Are you ready to have a set of shade sails installed in your property? Give us a call. Our team will be more than happy to discuss your needs, and afterwards, we will send our team to discuss the best options for your shade sails.